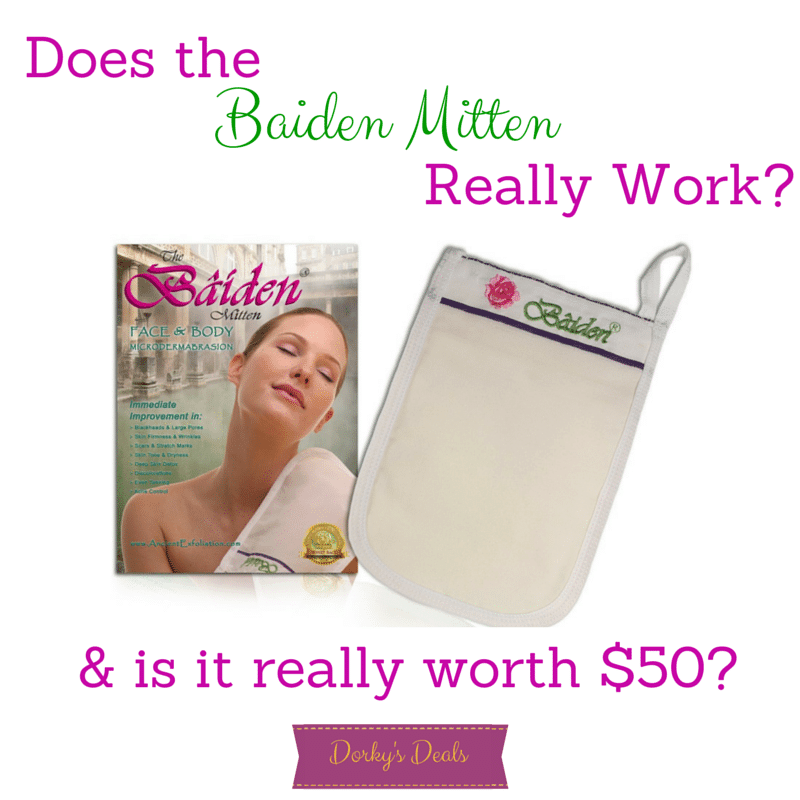 You are here: Home / Lifestyle / Beauty / Does the Baiden Mitten Really Work? Is it Worth $50? This conversation on exfoliating was sponsored by Baiden Mitten. View our disclosure policy here. When it comes to exfoliation, the Baiden Mitten has been referred to as the BEST exfoliation method time and time again. This exfoliating mitten is said to improve dry skin, wrinkles, scars, cellulite, stretch marks and blackheads, while firming your skin and minimizing pores. I have wanted to try a Baiden Mitten for myself for over a year, but the steep price tag held me back. Now that I can FINALLY say that I am the proud owner of my very own Baiden Mitten, I want to share my experience with you. After soaking for about 15 minutes in a nice hot bath, I wet my Baiden Mitten and wrung it out. I stood up and put the Mitten on my right hand. Without drying my skin I began rubbing the Baiden Mitten in a back-and-forth motion on my legs. Skin began to literally roll right off my leg, and fall down into the tub. Whoa! I kept rubbing, back-and-forth and then in an up-and-down motion. I continued until I had finished both my legs. I switched the Mitten to my other hand, because my right arm was tired, and needed a break. I continued with my left hand and rubbed the rest of my body, back-and-forth and up-and-down. The amount of skin that had fallen into the tub by then end of my first exfoliation session was absolutely amazing. I rinsed off and then had to use several tissues to pick up all my skin that had gathered in the hair catcher in the tub drain. It was disgusting, yet wonderful all at the same time. I dried off and then I followed up with my favorite moisturizer. My skin had never felt so smooth in my entire life. I couldn't stop feeling my skin – it was so smooth and soft. My skin was pink for a few hours after exfoliating, and I was glad I didn't have to leave the house until the next morning. By the time the next morning came around my skin had returned to its normal color, but still felt as soft and amazing as it had the night before. I can't wait until next week when I get to use the Baiden Mitten again. Do not shower before using the Baiden Mitten. The use of soaps or cleansers can impede exfoliation. Just soak in a hot shower or bath before hand, and then take a real shower afterwards. Rub in back-and-forth and in up-and-down motions. Not circular. Save your face for last, once you get the hang of using the mitten on your body, and get a feel for how much pressure you should use. Enlist the help of a family member to get to the hard to reach places on your back with the mitten. So the answer is “Yes!” The Baiden Mitten does work as well as everyone says it does, and “Yes!” it is worth the price tag. There are a plethora of imitation exfoliating mitts and towels. Do not fall for these cheap imitations – I have use a few of them myself and can tell you that they do not exfoliate any better than a regular loofah. If you want deep, dramatic, real exfoliation, you need the Baiden Mitten. Oh wow! I never would’ve expected to see that much skin come rolling off. I still don’t know if I could pay $50 for it. But after seeing that I might have to consider it. Interesting! Thanks for the thoughtful review. I wonder if it would be okay on my sensitive skin? WHOA! That’s an exfoliator all right! Not sure I’d pay that much personally but would definitely love to test it out myself. This looks like a product I would like to try. I think I NEED one of these. My skin is so dry in the winter. I think that needs to go on my list for Santa. It sounds amazing! Wow, I haven’t heard of the Baiden Mitten. Looks like it does a great job on exfoliating dead skin! This is interesting, I’m gonna check it out to learn more. I imagine you’d feel like your skin could really breathe after doing this! Well, I hadn’t heard of it until just now but you’ve got me extremely curious. I love that it leaves our skin so soft. Wow, I can see by the photos that it works well, though I was looking with a bit of a grimaced look. I think this might be just what I am in need of. Gosh do they offer you to give a discount? If so email me. I’m speechless. Ok, not really but WOW! At first I thought it was one of those Korean loofah-type gloves that I’ve seen. But…WOW! Pinning and saving my pennies to get one!!! It is a lot of money, if I could afford it, I sure would want it! It is a nice way to pamper yourself!